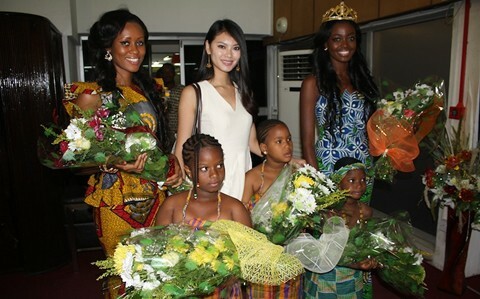 The reigning Miss World, China's Wenxia Yu, the CEO of the Miss World Organization, Julia Morley, and six other members of the organization have arrived in Ghana to lend support to the Miss Ghana Foundation's charity projects in northern Ghana. They will spend a week in Ghana and their visit will include a courtesy call to the President of Ghana and witnessing the crowning of Miss Ghana for Miss World 2014. They were met at the airport by the reigning Miss Ghana and Miss World 2013 hot favorite, Naa Okailey Shooter (Right), and members of the Miss Ghana Organization. Which of the 2 ladies, is Miss Ghana and who is the other one with Miss World?